I’ve done a Spartan Sprint, a Warrior Dash, have completed a full 26.2-mile marathon and several halves. But I’ve never experienced anything like a Tough Mudder. A Tough Mudder is roughly 12 miles full of obstacles, climbs, hills, electroshock therapy, water and a whole lot of mud. Clean freaks need not enter, and the weak need not sign up. A few weeks ago, I was asked to participate in a Tough Mudder on behalf of Aeroshot energy, a new kind of energy that you spray into your mouth through a shiny plastic applicator. It sounds weird, and it kind of is—but it works! It doesn’t spill like coffee can, it’s easily transportable and it feels instantly active. If you like pixie stix or have had them before, it’s kind of like that substance, but not sugary sweet. Anyway, I was asked to train and compete as part of Team Aero, and since I’ve been wanting to do a Tough Mudder for awhile and am always up for trying something different, I happily agreed. We got to attend training sessions with Michael Olajide Jr. (he trains Adriana Lima, just an FYI, and past clients include Hugh Grant and 50 Cent) atAeroSpace in the city once a week. Classes were an hour long and alternated between using jump ropes, a bar and weights. We did a lot of variations of jumping, squatting, lunging, punching, pushups and ab work, and I have to admit—I haven’t had that kind of workout in awhile. It was definitely a good idea to jump start some upper body work, as the Tough Mudder requires a lot of arm strength. On race day, Team Aeroshot, consisting of me, Lauren from Fitness Magazine, Abby from Shape Magazine, and Stephen from The Roosevelts, a men’s lifestyle website, met up at the crack of down (okay, 7:45am) to make our way to Englishtown, NJ. Upon arrival, we got suited up in our Team Aeroshot garb, pinned our race bibs on and got inked in permanent marker on our foreheads. I won’t describe every single obstacle, but there are some that deserve a mention. The first, called “Arctic Enema,” consisted of jumping into a pool full of cold water and legitimate ice cubes, ducking underneath a pool divider, and emerging on the other side of the pool—but first you needed to fight your way through even more ice cubes to get to the surface. It was like something from “Trapped Under the Ice.” Luckily, Tough Mudders are all about camaraderie and community, so a very helpful hand was waiting for me at the other side ready to pull me to safety and dry (cold) land. Others that stuck out in my mind were “Electroshock Therapy,” or army crawling through a mud and water pit while getting shocked by above electrically-charged vines; “Walk the Plank” which was basically just jumping off a solid platform and freefalling fifteen feet into a pool of water, another I can’t recall the name of where we had to ford across a river and climb up rope ladders on the other side, and “Everest,” a giant wall where we had to run up a near-veritcal wall to be caught and helped over by strong hands already on top. Though the obstacles and mostly water were tough, the hardest thing was definitely withstanding the cold. It was freezing, and being drenched didn’t help! 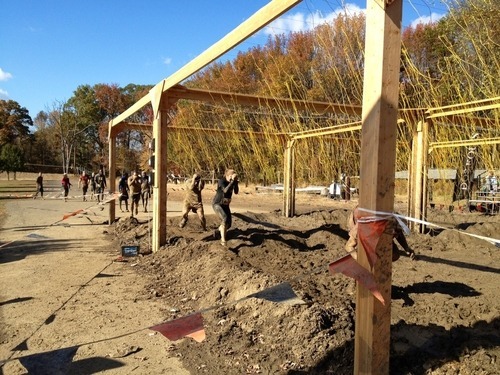 When I crossed the finish line at the Spartan Race, I was relieved and proud of myself. But when I crossed the finish line at the Tough Mudder, I was not just proud—I was impressed with myself, and my teammates. Luckily, we had Stephen to help us over the many tall walls, and a good team vibe going. I definitely plan on doing another challenge, but when it’s warmer out—chattering teeth and mud don’t go too well together (ie, mouthfulls of mud). Planning to take on a Tough Mudder in the future? Here are a few pointers! Wear warm clothing, but nothing bulky. You’re going to get wet and muddy—if you’re wearing a sweatshirt or baggy clothing, it will get filled with water and add extra, unbearable weight. I would suggest wearing Under Amour, or clothing of equally durable substance. Expect water. The challenge has more than its fair share of water obstacles, and you will be sopping from head to toe. You will also probably be swimming at some point, so make sure you won’t need someone to rescue you! Bring shoes you are comfortable throwing away. You won’t want to bring those muddy buddies back into your home, apartment, or living area. Help others. There are many times during the challenge you will find yourself slipping down a mud pit or falling off a ledge—until a strong hand reaches out and pulls you to the top. Return the favor. Don’t underestimate the course. It’s called TOUGH for a reason. You will travel 3 miles and think you are on mile 8. Not yet. Keep going! Tie your shoe laces tight! If your shoes are too lose, they may get lost in the mud! When it comes to electric shocks, go fast! The faster you power through those zapping cords, the less you feel them—and the quicker it’s over!